Earlier we told you about Snap2Face, a Windows Mobile Facebook app that let you upload your photos from your phone to Facebook. But now, a real Facebook app has launched. Thanks to Macrospecs, Inc., you can download FriendMobilizer, a new software app for Windows Mobile phones that gives you full access to your Facebook account. 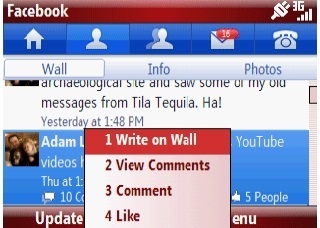 This app is very similar to the app that runs on RIM’s Blackberry devices as it lets you view your friend's information and profiles, write on their walls, browse photo albums, approve friend requests, view group and event invites, read your new wall posts, read the messages in your inbox, update your status, and more. The application currently works on both Windows Mobile devices and Pocket PCs and it’s available for download from www.faceofmobile.com. According to the company, they will be building mobile apps for other social networks in the future, too. I think you may want to look at Snap2Face again. They have updated the software to include all the email/poke/status/wall functions, in addition to the original photo upload feature. Plus, the software works anywhere in the world. Ah, thanks Emily - I didn't know that - wonder how it compares?